For environmentalists you have no choice. It is only their way. They prove this by taking environmentalism, an idea that everybody agrees is good to some extent, and claim that only they care. They use this to take the moral high-ground from which they create fear and falsehoods to eco-bully people into line. None of the environmental issues of the last 30 years bear any investigation. They are unfounded, often taking natural patterns and processes and presenting them as unnatural, knowing people are unaware. For example, animal populations fluctuate a great deal in a boom or bust pattern. Nowadays they only report declining populations, you rarely hear about an expanding population, unless it is deemed to be an invasive species introduced by humans. “A staggering 86% of all species on land and 91% of those in the seas have yet to be discovered, described and catalogued”. Saki (H.H Munro) said, “A little inaccuracy sometimes saves tons of explanation”. Today we have tons of inaccuracy and very little explanation. Most inaccuracies come from claims based on non-existent or inadequate historical data, extremely crude estimates, computer model projections, or are simply incorrect or created. As somebody said, 83 percent of statistics are made up on the spot. It’s prevalent in all environmental issues but particularly bad with climate and animal extinctions. The reason is that they are the most politicized and emotionally suitable: the sky is falling, and animals are dying, which automatically takes them further from the truth. As Henry Adams said, “Practical politics consists of ignoring the truth”. Environmentalists successfully, but inaccurately, present natural events as unnatural. It works, because most don’t know what is natural. They also exploit the public belief that change is gradual over long periods of time. Use of the word “belief” is deliberate, because it represents the philosophical, pseudo-religious basis for western science – Uniformitarianism. This is the idea that change is gradual over very long periods of time. It applies both to climate change and extinction of species, creating the false understanding that they are not supposed to happen. If they do then, by default, it is unnatural and due to humans, whom they consider unnatural. The 1990 Greenpeace Report on global warming says, CO2 is added to the atmosphere naturally and unnaturally. As Goethe said “The unnatural – that too is natural”. “It takes a very unusual mind to undertake analysis of the obvious”. At the end of the 18th century, Bernard Kuhn and James Hutton recorded evidence of a recent ice age in the European Alps. Louis Agassiz observed similar evidence in North America. A paper he gave to an 1837 conference began the overthrow of established geology. Agassiz was derided at the conference and responded by taking delegates out to the mountains and showing them the evidence. Even today, most can’t imagine that a glacier, larger than the current Antarctic glacier in area, covered over half of North America just 18,000 years ago. After Agassiz, the philosophy of geology and overall western view of the world changed. Neptunism, the belief that the landscape was shaped by the biblical flood, changed to Uniformitarianism, the result of slow processes over long periods. A debate, including in the climate community, raged in the late 1980s and early 1990s involving the replacement of Uniformitarianism by Chaos Theory and Cyclic Theory. Communist block scientists said climate was the result of the interaction of multiple cycles creating a net climate. The West, particularly the US, was pushing chaos theory. Western media interpreted this as a political divide of the Cold War. It wasn’t. It was an intellectual divide within climate science that continues today. Stephen Jay Gould introduced another option he called Punctuated Equilibrium. This was Uniformitarianism with periodic interruptions by catastrophic events. There was discussion at the time about equilibrium and whether the global system is a transitory or a non-transitory system. That is, if pushed from equilibrium, would the global system return to it or establish a new equilibrium. This implies there are tipping points, which are often part of the threats used by environmentalists; we are approaching a “tipping point’ that unless we change our behavior will be the end. The threat of “Peak oil” was a typical example. 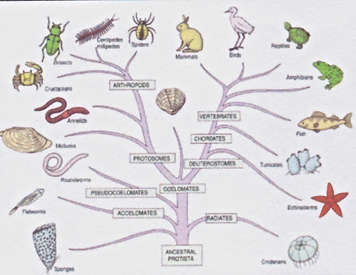 Gould, in his book, “It’s a Wonderful Life“, surreptitiously implied that Darwin’s claim of evolutionary expansion with ever-increasing speciation, the familiar tree of life (Figure 1), was incorrect. The book argues that this is contradicted by the multitude of creatures found in the Burgess Shales. (This is another little-known world treasure within Canada.) It suggested there was an “explosion of life,” followed by a gradual reduction of species through extinction, in other words, decreasing speciation. 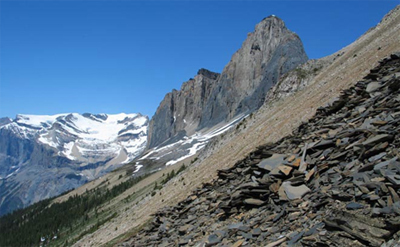 The Burgess Shales is described as evidence of the “Cambrian Explosion”. It is a remarkable deposit because, almost uniquely, creatures without skeletons were preserved. The fossil record is problematic because, apart from soft-bodied creatures not surviving, it is estimated that a few million in a species is required for one to appear in the fossil record. Then there is the Coelacanth believed, from the fossil record, to have gone extinct 65 million years ago, yet found alive in 1938. Gould’s implication is that extinction is natural. An initial large number of species is reduced, over time. Environmentalism assumes extinction and climate change are unnatural. They claim both are occurring at unnatural rates because of human activities. But to determine the human impact, you must first know the natural condition. The Intergovernmental Panel on Climate Change (IPCC) was charged with measuring human causes of climate change, but that is impossible unless you know the natural situation. “It’s the first time that anyone’s done this expedition looking specifically for plankton life, and that’s why we found so many”. Some say these are minuscule creatures, and therefore the number is not impressive or consequential, however, many large animals are regularly discovered. “Biologists worldwide may have to start re-evaluating their estimates of the number of species on Earth, since expeditions documenting the oceans’ tiniest species have revealed shocking diversity: in the tens of millions of species, at least, and according to one researcher “closer to a billion”. from the Muller Range mountains in Papua, New Guinea. “The fact that we do not currently know the total number of species, in the past nor the present, makes it very difficult to accurately calculate the non-anthropogenicly (sic) influenced extinction rates”. There is a steady flow of stories about new species discoveries. Here are just a few recent ones. 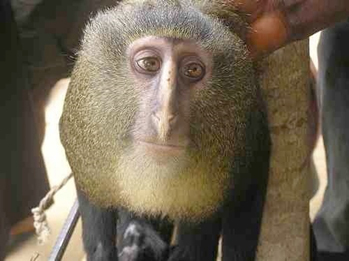 2010 Over 200 New Species Found In Papua New Guinea. 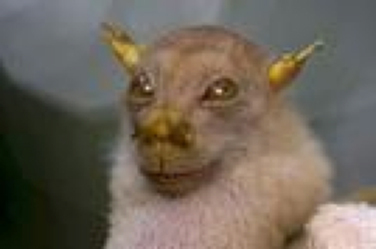 The lead scientist said, there are, “large areas of New Guinea that are pretty much unexplored biologically”. 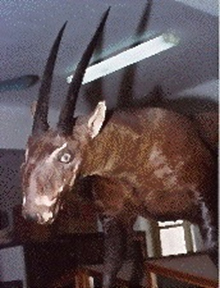 It is also estimated that of those claimed extinct, one-third are found later. The climate website Watts Up With That? (WUWT) related the story from the Global Warming Policy Foundation (GWPF) of how the Royal Society used a false extinction claim, in its zeal to link it to human-caused climate change. One of the major links of numbers and rate of extinction to human-caused climate change claims, originate from the work of E.O.Wilson, an honorary Board member of the Suzuki Foundation, according to the 2003 Annual Report. Wilson’s idea of extinction is based on false assumptions and simplistic mathematical estimates. The trouble is it isn’t happening. Wilson began with a false reconstruction of species extinction linking it to the human population as Figure 2 illustrates. Figure 2: Graph based on Wilson’s mathematical model. 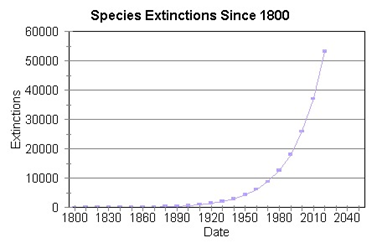 Wilson claims approximately 27,000 species go extinct every year or 3 per hour. He came up with these numbers by assuming the number of species in one square mile of rain forest and then estimating how much rain forest was lost each year. Incorrectly, he applied this tropical species loss to the entire world and then predicted 22 percent of all species will be extinct by 2022. If you don’t know how many there are, you can’t prove or disprove this claim. Regardless, the threat of extinction is a powerful emotional weapon in the environmentalist’s arsenal, especially if it is a big-eyed cuddly animal like a Koala Bear or Panda. Throughout history, there are mass extinctions, some apparently random, like the demise of the dinosaurs related to the asteroid event 65 million years ago. This discovery seemed to support Gould’s hypothesis. Others appear more cyclical, such as those associated with polar magnetic reversals. Then there are those caused by climate change. The most recent example is the post-Pleistocene glaciation extinction including Mammoths, Mastodons, Sabre Tooth Tigers, Irish Elk and so on. Some blame humans for these extinctions. There are two major problems with this claim. First, there were very few people surviving as hunter-gatherers. Second, pressure on wild animal stocks was reduced as humans switched to sedentary agriculture and domestication of animals. Environmentalists assume that humans are causing extinctions, either directly, by over-hunting, or indirectly through habitat destruction. They never consider the number of species that benefit from changed habitat, or species created, directly or indirectly, by human actions. They consider those benefitting from human activity unnatural. Extension of the idea that humans are destroying their habitat raises the fascinating question of whether a species has ever brought about its own extinction. What happens if the Dutch Elm Beetle kills off all the Elm trees? It’s too bad the dinosaurs or all the other species that became extinct long before Homo Sapiens came on the scene did not know of this. Before you conclude that Ms. Newkirk is alone in this extreme view, consider Richard Conniff’s comment in “Audubon”. Why do they need a few beers to say what they really think? Instead, they use a steady stream of misinformation, distortions, and selective claims that are not based on facts or reality; the extinction and biodiversity claims are classic examples.